A growing part of Johnson County, Kansas is slated to get a new park. This week the county unveiled proposed plans for Camp Branch Park. The roughly 230-acre park will be along Mission Road from 175th Street to 183rd Street. In the proposed plans, the county designed the area as a nature-based park. It will include hard and soft trails, a disc golf course, picnic shelters, open views, prairie restoration. 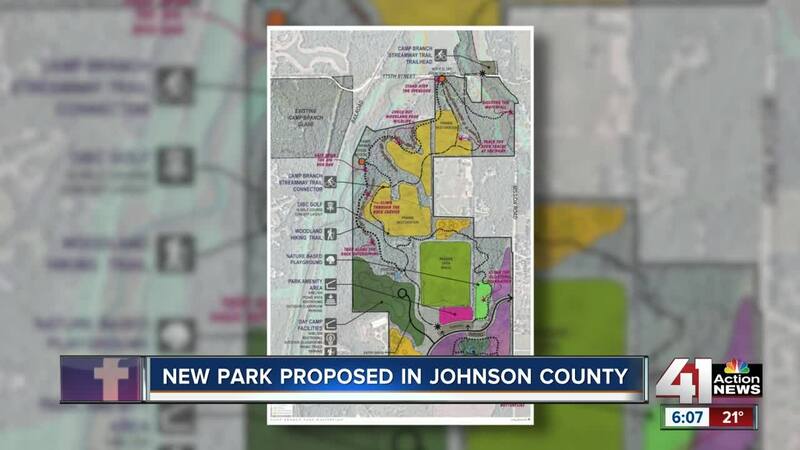 SHAWNEE, Kan. — A growing part of Johnson County, Kansas is slated to get a new park. This week the county unveiled proposed plans for Camp Branch Park. The roughly 230-acre park will be along Mission Road from 175th Street to 183rd Street. In the proposed plans, the county designed the area as a nature-based park. It will include hard and soft trails, a disc golf course, picnic shelters, open views, prairie restoration. It is not slated to have sports fields or bright lights. People living along Mission Road said they like the idea of having nearby trails. "We love to walk right now, but there’s really no good place to walk. Laps in the cul-de-sac get a little bit boring," Jackie Faust said. "So we're excited about having it across the street. And we know parents of the kids here are excited about it too." Faust and her neighbors met Wednesday night. They have one concern with the current park proposal. Plans call for building a road to cut through the park and connect with 180th Terrace at Mission Road. Faust would prefer the new road not connect directly to her neighborhood. "It's just a little bit more traffic. We have over 20 kids under the age of 12 in this neighborhood, just in 10 houses. So that’s a lot of kids playing in the street," she said. The county is collecting feedback on the proposal via an online survey from now until March 11. This spring, the park and recreation district will bring a plan to its board for approval. Deputy director of Johnson County Park and Recreation Jeff Stewart said the county acquired the land in 2004 to preserve as a park. In about 2015, the county raised the mill levy it charges properties to pay for more parks and park improvements. That increase got the ball rolling on turning the land into a space everyone can enjoy. "As everyone knows, Johnson County continues to grow rapidly so this will continue to serve some of those needs," Stewart said. At this point of the master plan, Stewart said it's too soon to estimate how much it will cost to develop this park. He added the county earmarked nearly $5 million for park development in 2021.